ELGIN — During his time as Wolfpack Girls Basketball Coach, Randy Eisenhauer has made his mark with teams that never stop running. Through the years, his teams have played up-tempo basketball which has allowed the Wolfpack to dominate foes. Beginning his 16th year as head coach, Eisenhauer hopes to continue the success he’s had on the court again this season. To do that, he will have to replace three starters and a top reserve from last year’s team which compiled a 15-7 record. This year there are 13 girls out for basketball. In that group, there are some outstanding players and some young players waiting for their chance to make their mark on the success Wolfpack teams have had. 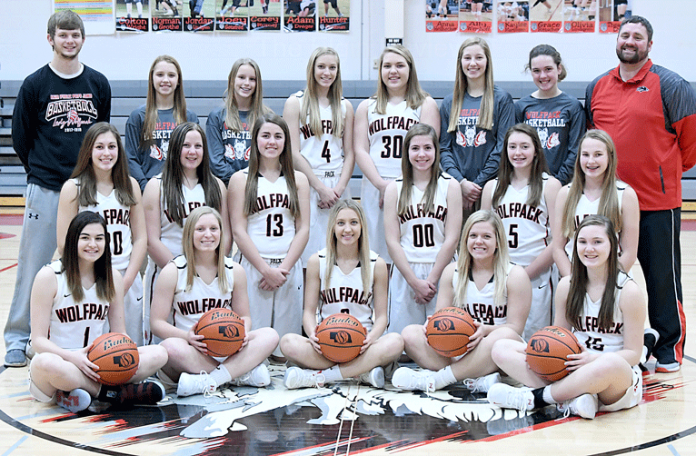 Early season success by the Wolfpack can often be attributed to the team wearing down opponents with their fast-paced play. Playing fast has helped Ally Wemhoff become one of the better point guards in the area. A senior, Wemhoff, who has started every game in her high school career, was the team’s leading scorer last season, averaging 11.5 points per game. She was also the team leader in assists and steals. The other starter returning from last year’s squad is senior Kaylee Martinsen. Averaging nearly six points a game last year, Martinsen was one of the team’s best rebounders. Junior Kayce Kallhoff, one of the top bench players last season, will step into a starting position as well as senior post player Grace Rittscher who played at Clearwater/Orchard last year. Rounding out the starting five will be sophomore Kirsten Krebs. Reserves will play a key role in keeping the Wolfpack attack strong. Sophomores Harlie Bode and Ally Selting, senior Araceli Palmer and freshman Lexi Bode will, during the course of the season, come off the bench to fill in where needed. Coach Eisenhauer had a quick answer when asked which team has the best chance to win the Niobrara Valley Conference tournament this year. He said Ewing has almost everybody back from one year ago, Chambers/Wheeler Central is very talented and Elkhorn Valley should be strong also. One thing which he expressed good feelings about is the postseason. Like volleyball, basketball teams will have to win their sub-district, then win a sub-state game to advance to the State Tournament. All sub-district champions will be seeded, based on power points, for the sub-state matchup. 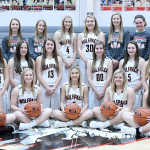 That means the Wolfpack, if they advance that far, won’t see teams like Crofton or Hartington Cedar Catholic standing in the way of a trip to state as they have in past years. The Wolfpack will open the season at home Friday night against Niobrara/Verdigre.